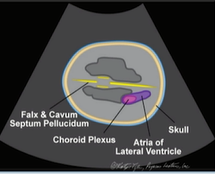 Fetal cranial structures are a bit intimidating to assess if you are not familiar with their sonographic appearance, especially in evaluating fetuses in the 2nd trimester, when structures are very, very small with the cranial diameter ranging from 2cm to 3cm. Add to this challenge the anechoic to hypoechoic properties of nearly all the sub-cranial anatomy, and you can appreciate the challenges distinct to fetal cranial sonography. The ability to recognize both normal and abnormal congenital development is critical for early identification of pathologies. 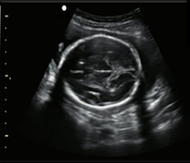 Because fetal cranial abnormalities are atypical (average occurrence of less than 1 in 100), many sonographers do not gain the experience and familiarity with these conditions unless their practice area is intensely prenatal. I have written previously about the importance of specialization in advancing your ultrasound career. With regard to fetal specialization for sonographers, there is a level of expertise that carries a higher burden. At the same time, the compensation for sonographers with a fetal specialization is typically above the top 75th percentile in industry salary ranges. Additionally, having the experience and confidence to properly consult with both medical professionals and prospective parents can be very rewarding. This entry was posted in Quick Concepts and tagged analysis, imaging, ob/gyn, Quick Concepts. Bookmark the permalink.